Oh my goodness I have to tell you about this wonderful shampoo, I want to shout about it from the rooftops. 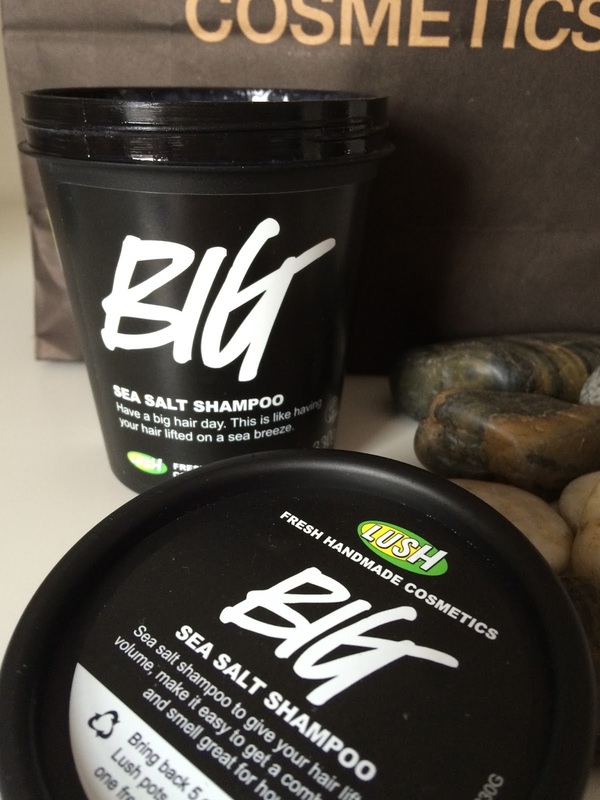 At the Lush event I got talking hair to one of the expert assistants and she introduced me to BIG. I explained about my hair being oh so fine and flyaway, and that I just wanted it to have a bit of body, fullness and you know, general oomph. I was given a little pot with BIG in it and she promised I would love it. And bloody love it I do. I can't even find the words for how much I love it and washing my hair is no longer a chore, it's seriously changed my life. 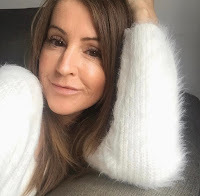 I've tried so many different shampoos and conditioners, some expensive, some not so, they all promise to give my hair body and lots of volume but none have really delivered so I was a little sceptical that a natural product could be any different. I took my little pot of BIG into the shower and was taken aback when I put it on my hair. I was expecting a liquid shampoo, not a product with the biggest salt crystals ever in it, I put a dollop on my head and started to massage it in. The course sea salt crystals give a nice massage, lifting the hair and adding volume. Another thing I was surprised about was the amount of lather it created, there was lots of it, again something I wasn't expecting with a natural product. I know this might sound silly but I could actually feel my hair getting bigger as I was massaging, I kid you not, it was like some kind of magic! I've read some reviews where people have said they struggle to get all the crystals out, but in all honestly for me there's not much that doesn't dissolve anyway, and any small salt deposits that are left rinse out really easily so I don't find it an issue. This pot of magic contains sea salt obviously, coconut oil, a favourite product of mine for conditioning and strengthening, seaweed and also lemon and lime to give your hair some serious shine. Oh and it smells real nice too. Forget all your synthetic, silicone loaded shampoos and conditioners, my hair was about to go natural full time. Off to the store I went for supplies. I did say they were big course sea salt crystals didn't I? That's what makes this shampoo special. Very special. We all like to have a conditioner to work in harmony with our shampoo don't we girls? So, I picked up the BIG conditioner bar, oh, and the sea salt spray, well I might as well go the whole hog and feel like a full on mermaid! I'm not sure how I feel about the conditioner bar yet, I don't mean the results it gives, the results are fabulous, I just mean for me it's more tricky to use and get on your hair. I've been rubbing it between my hands and then massaging that into my hair but also rubbing the bar over my hair and onto the ends to get more of the product on. It's hard to know went to stop, or when you've applied enough as it doesn't feel like there's much on your hair. With a traditional conditioner you know exactly how much as you pour it into your palm and it's easy to use, unlike with the bar, that feels like there's kind of nothing on your hair to massage in, yet there obviously is. I'm getting used to the application technique and it most definitely deserves a place on my bathroom shelf. So after washing your hair you have to dry it right? I gave it a spritz with my sea salt spray and blasted away with the dryer. You do not need much!By the way you can use the sea salt spray on damp hair as I do or you can spray on dry hair to use as a light fixing spray. I haven't tried this option yet though so can't comment. I wasn't sure what to expect on the first wash, with other shampoos I've managed a little volume and lift, nothing spectacular and nothing that really lasts through the next day but WOW......my hair had grown to twice it's size. No seriously, I could not believe my eyes. It felt massive, I mean it wasn't massive but it had volume, it looked so healthy and was so soft and shiny, I couldn't stop running my fingers through it. My hair felt amazing and it continues to feel amazing every time I use BIG. I made the mistake of telling Mr C about how impressed I was and made the second mistake of leaving it out on top of the bathroom cupboard. Now he wants his own tub of BIG. Compared to other shampoos it costs a little more but in my opinion, if it works, and this does what it says on the tin, then it's worth a little splurge to make you look good and feel good. Lush, please never, EVER discontinue this stuff!!!!!! If you want a 'big hair, don't care' kinda day, go ask for a sample of BIG and say I sent you. Do you use a natural shampoo? Have you tried any of the Lush one's? AHHH I NEED THIS! It has all the natural products I love....and who doesn't want a big hair day!?!? I know me too Marta, coconut oil being my fave. Thanks for reading! ha ha ha...you should definitely give it a go then Laura, I think you'll be impressed. It is amazing Heather, as you probably know Lush are more than happy to give out samples before you buy so you should go and get a sample, although I'm quite certain you will love it! Hi Sarah, surprisingly I was never a big fan os Lush until recently and i seriously cannot rave about this product enough as you can probably tell!! I know some products do have a short shelf life but but like you say being a shampoo its not something that sits around for long. Take care.